East Jakarta Administration is going to help accelerate the fundraising of the Indonesian Red Cross (PMI). Thus far, of the Rp 7 billion targeted, only 50 percent has been collected.
" We hold a coordination meeting to provide motivation and encouragement to optimize PMI's fundraising"
"We hold a coordination meeting to provide motivation and encouragement to optimize PMI's fundraising. 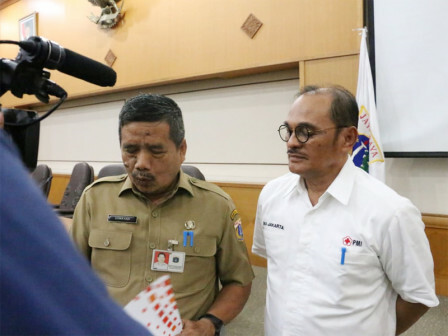 We also ask all units to help PMI fundraising maximally," expressed Usmayadi, Secretary of East Jakarta, after leading a meeting coordination, Monday (11/5). According to him, the ranks of PTSP in urban village, sub-district, and city level are hoped able to help also. To the people who propose permit, should be invited to conduct social work by setting aside their sustenance for PMI. Meanwhile, East Jakarta PMI Head, HR Krisdianto added that the target of the PMI's monthly funds this year is Rp 7 billion. It is higher than the last year's target reached Rp 5 billion. Yet, until now, the PMI only managed to collect around 50 percent of the total target. "The role of the people is very much needed, as PMI funds are from people by people and return to them again," he stated.